Greedies - a welcome boost to Isleworth's night life. Isleworth's best kept secret is throwing open its doors at night from August onwards. The restaurant, which is normally packed with hungry locals during the day for breakfast and lunch is being transformed at night with live music and the introduction of a delicious new menu. 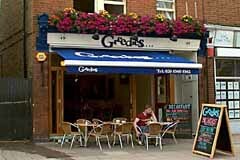 Greedies has recently undergone some major changes with the addition of a new conservatory and a complete redecoration. The restaurant has grown from strength to strength under the ownership of husband and wife team, Gary and Jenni O'Connell. It is well known for its eclectic menu that changes weekly and its casual, family orientated atmosphere. Every once in a while a restaurant happens along that not only blows all others out of the water, it sets standards that others can only strive for. Greedies is one of those places � the most sumptuous breakfasts you can imagine, lunches that will fill gaps you didn�t even know you had, and a dinner menu to set your heart racing. All this in an atmosphere so relaxed and inviting it�s like eating at home. Not only that, you can read the papers or watch TV whilst you eat, or just sit back and watch the world go by. All our daily dishes are on the blackboard menu, complemented by a superb evening menu. The restaurant is also fully licensed and offers a wide selection of fine wines and beers from all over the world. For those with a sweet tooth Greedies boasts a mouth-watering dessert menu that is not to be missed. The hot toffee cake is sure to be a hit amongst patrons and is served with butterscotch sauce and ice cream. "We are delighted to be opening on a Thursday, Friday and Saturday night. Isleworth needs a place where people can go at night to enjoy themselves and have good food. We hope that by opening at night we can fill that gap and people can come in to relax and enjoy a meal after work or a long day" commented the owner of Greedies. Greedies new evening menu offers a variety fo dishes for all tastes from peppered lamb steak served on a warm new potato, a black olive and marinated feta cheese salad with pesto butter to red Thai spicy coconut chicken which is served with stir-fried bok choi, rice and chargrilled limes. Open for breakfast, lunch and dinner (dinner Thurs-Sat). Dinner menu offers a variety of dishes for all tastes with a wide selection of fine wines and beers from all over the world. Daily changing day-time blackboard menu. I just had brunch with a friend. Outstanding!hly recommend the egg floretine! I will definitely go again!